A logo graphically represents a business, an organisation, product or precincts identity. Moulded through design, font and colour a logo is a unique and distinctive mark. It is a symbol that will help customers identify you, so it must be unique to your business. A brand encompassing philosophies and unique selling points, a brand is what sets you apart from your competitors and peers. It should be relevant, desirable, believable, enduring and create an emotional connection with it’s audience. So, what’s the difference between a logo and a brand? A logo is just one element of your brand and all elements of a brand should work together to create an emotional connection with it’s audience. Lately the internet has been a buzz with the news from Google, about a planned change in it’s Algorithm on April 21. For a while now Google has been signalling that due to mobile searches rapid growth, websites that want to perform should be transitioned to being mobile friendly. Recently though, Google put a date on a scheduled change in their algorithm which means it will use mobile-friendly design as a ranking factor in mobile search. This means that mobile friendly (responsive) sites will be rewarded and non mobile friendly (non responsive) sites will be penalised in search results. Our advice would be that if want to continue to be found through google and your site isn’t responsive then it is time to put a plan in place and timeline. If you would like to discuss transitioning your site to being mobile friendly, get in touch! Google My Business (Previously known as Google Places and Google Plus Local) is a an online resource by google to help businesses, brands, artists, and organisations to manage their online presence with Google. If your running business and not using Google My Business then you are missing a potential opportunity to help your customers and clients find you and to speak directly to them. As Google is one of the most used search engines, it is an easy decision to make. It is a free service that will help your business be found, and the more you update and ask for client reviews, the more Google will reward you. If you are already using or considering using some form of social media, it is as easy as taking that content and putting it into your Google My Business page. There is nothing quite like the buzz and excitement of a new business getting ready to launch itself into the market. This is why we have taken the plunge and launch a sister business, ‘We Love Startups by Neon Zoo‘. We Love Startups by Neon Zoo, is a logo design service tailored specifically to people with great ideas and lean budgets AKA a startup businesses. It is designed to help businesses set up the some bare essential branding items that they will need in their infancy to help them grow quickly and effectively. All projects are completed through our online forms, but our clients still benefit from being able to call the studio for phone support. It is a paired back version of our larger brand packages, intended to help get new businesses through the essential testing period their products and services as quickly as possible. The website is also a resource where you can read stories from other Startups, and find the resources, tips and tools that a new business needs. We’re really exciting to be launching ‘We love Startups by Neon Zoo, so I hope you will share our exctiment by telling anyone that has been thinking about turning their hobby into a career or is getting ready to step out on their own. For more information please email us at hello@welovestartups and follow us on Instagram and Facebook, if you would like to show us some love. Aziz Sahu-Khan Orthodontics needs very little introduction.It is hard to over look the vibrant, cheerful and colourful elements that make up this new brand design. Our brief was to create a new brand that was bright and cheerful as well as reflective of Dr Aziz Sahu-Khan’s personality! Our designs were based directly on our immediate response to meeting Dr Sahu-Khan. His infectious and engaging personality, as well as the bright, individualistic Hawaiian shirts he wears to the clinic daily provided us with great inspiration. 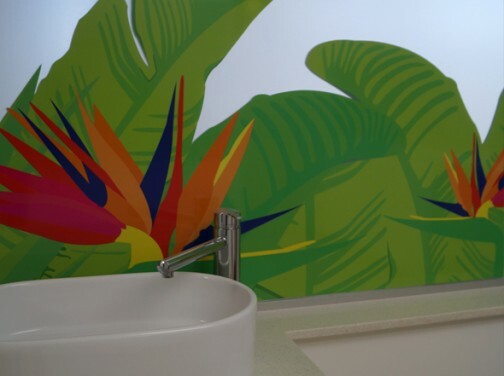 Patients of the clinic are now greeted with the brand pattern of lush greenery and birds of paradise that is featured on walls, doors and partitions throughout the clinic. Directional signage throughout the landmark building also now pops off the walls to point you in the right direction. It was a please to work on this project and i hope that you will now keep an eye out for Aziz Sahu-Khan Orthodontics clinic as you travel down the Pacific Highway Charlestown. Dr Sahu-Khan is a cleft palette and craniofacial specialist and his clinic is located in the Landmark building, Pacific Highway Charlestown. How can a brand increase your businesses value? A good brand takes an investment of a lot of time, effort and creativity but when assessing a businesses value, this investment can some times be overlooked. But can a brand really increase the value of you business? Many of these are tangible items or figures that can be worked out using formulas. But can you really value a business based on it’s brand? A strong brand can influence buying decisions and create relationships between a business and it’s consumers. A strong brand could therefore generate more income through consumers choosing their product or service over another based on brand elements (name, logo, packaging etc) and people’s perceptions of that brand. A company with a strong brand has better potential to expand its product range, maintain and grow their market share through repeat business and consumer loyalty. It also gives businesses the power to charge a higher fee for for a product or service that is the same (or very similar) to another product in the marketplace. Think about some of the go-to brands? Apple, Bonds, Nike, Coca-Cola. Why does the public continually support these brands? What factors affect people’s buying decision and to pay more for their products? So how can you strengthen your brand? Secure your brand by Trademarking it. Continue to develop, strengthen and grow your brand and it’s personality (it does not stop with just a logo). Get brand advocates, i.e people who will speak favourably of your brand. If you’re looking for a unique vehicle to hire, combining both a laid-back café culture and premium personalised service, then say hello to Retro Kombi Co. The two stars of the Retro Kombi Co. family are Errol and Olive. Servicing ‘day-to-day’ cafe culture, ‘Olive’ is the ‘roaming barista’ – a café/beverage service that travels around the Newcastle and Hunter Region. Olive, named after her beautiful green colouring, is equipped with an espresso machine and refrigeration for coffee and basic food service. Olive will also be set up to work at markets and festivals and available for hire as a pop-up bar for weddings and special occasions. Errol is the perfect gentleman, he has the most royal of blue hue & pearl white trims boasting timeless sophistication that will add elegance and charm. Ready to help make your wedding a memorable day, Errol will whisk your wedding party away and dazzle onlookers. As part of our work with Retro Kombi Co. we developed the branding concept and logo development as well as introducing sub brands for the two vehicles Errol and Olive. Neon Zoo worked with Retro Kombi Co, first to create a logo and brand design that they could use on their signage and promotional material. Their primary logo is black and white and then there are two other colour versions that (you guessed it) each matched to Olive or Errol. They branding also included a brand pattern that is reminder of the Kombi’s origins. Once their brand was underway we then worked with Retro Kombi Co. to design a website. Being a mobile business having a website where people can go to to view packages and see images of their vehicles was really important. Retro Kombi Co. will travel throughout Lake Macquarie, Newcastle and the Hunter Region. If you’re interested in Retro Kombi Co. for event hire, or if you’re like us and think the idea of a kombi van bringing coffee to your pad is totally coolsville, then check out Retro Kombi Co.’s website or follow their Instagram , Facebook or website to see where you can next catch Olive the roaming Barista. Here’s that they had to say about working with Neon Zoo. We’re back in the studio and ready for 2015. After some much-needed down time we’re all feeling rejuvenated and ready to sink our teeth into some new creative challenges. Have fun in the studio and enjoy the amazing people and projects that we get to work with! If you want to give your brand some TLC or have a new venture, project or idea that you want to get started, then just give us a call! Below are some holiday snaps from the Zoo Crew, three guesses as to where we all spent most of our time! The new year always brings big plans and resolutions, but like most people we start the year thinking we have plenty of time to achieve our goals and then quickly let the year slip away. We all know you can’t eat an elephant in one bite, so we have decided to share our goal sheet that we use to help us prepare and reach our targets. The planner helps to break down goals into bite size chunks, set a time lines and gives us a motivational reward for when we reach our target. Download the PDF here to set yourself up for your best year yet and to achieve the goals within your business or personal life.